Ricci Benemerito, a first-year accountancy student, who served as production coordinator, confessed that staging a play was very challenging. “Si Sir Yumul kasi, he has an eye for details, gusto niya plantsado lahat”, she explained, “pero napawi lahat ng pagod ko nang makita kong natutuwa ang mga manunuod”. 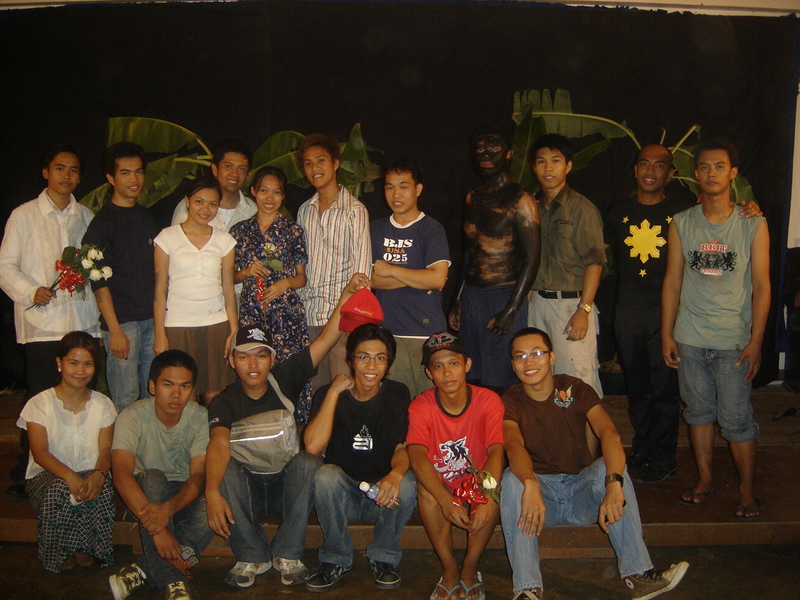 Dr. Joselito Lolinco, CAS dean, watched the play and was impressed with the talent and creativity of the actors and the production staff. “Mutya ng Saging” (The Banana Fairy), a work of Palanca-winner Leoncio Deriada, is an adventurous look at one man’s journey into the depths of Philippine folklore. The main character is Philip Parker, an American socio-anthropologist, who discovers the legend of a mysterious amulet that holds tremendous powers and good fortune, the anting-anting. Enticed by the stories of old by local villagers, Parker embarks on an adventure that brings him into the darkness of the Banana Tree Jungle where he sets out a quest to find this banana fairy. But to the foreigner’s shock and horror appears the guardian of this mystical jewel, the beastly creature known as the kapre. Parker beats the Kapre, but the former’s fate ends up in tragedy. The play was topbilled by Gheness Macaraeg and Kenneth Edra who performed the role of Parker, and Daryll Aglipay who was so convincing as the kapre. sir yumul…congratulations for a job well done.being a perfectionist like me” [you want plantsado lahat]’ that is what i meant when i told you “do it right or do not do it at all .i am looking forward for more plays when i come for vacation..keep it coming. Thank you, tita. Sometimes people focus so much on the total picture and they disregard the small details. Interesting that, sometimes, its the small things that make or break the whole. That’s why my cast and crew were always alert. and i love the shirt being black my favorite color i decided that even if i am not there[you know how people talk] i decide to wear black for a year to mourn my mom. Ah, panes. Theater crew usually wear black. I would wear black always, only that it’s getting unbearably hot here as summer has arrived. wen agpanesak. my sisters were already wearing colored clothes and they heard from me of course.it was not even a month. i dont care what they do now though because it’ s at least 4 months and i do not see them. I have done a study about Ilocano rituals and practices for the dead. They may be pagan, but they are meaningful, so I am all for them. i wish it is summer here.i thought spring has sprung .i just looked out the window and it is snowing. my flowers was starting to come out the lawn starting to get green,and my 2 peach 2 apples and 2 asian pear trees are budding .i do not know if it will affect them. That’s the nice part of your retired life, you can fully appreciate the seasons now, the changes in nature, God’s subtle signs. And your problems are not psych patients anymore, but flowers and and trees. Activities like the palualo, the gulgol, panagaramid ti kankanen, etc…. all these promote family/social solidarity.. So, sir herdy, where is the much awaited part in you- tube? Meron ba? Sana meron…excited-mode. We did not film it. We considered the play as an antithesis to today’s techie generation hooked on gadgets and the net. It was a very refreshing experience. The venue was so intimate it could only accommodate only up to 130 people. No microphones were used. We chose to have the play imprinted on our memories, and not on digital medium. I can still here the people’s laughter and cajoles, hehe. right you are! speaking of promoting family /social solidarity i saw my cousins and aunts from the states as well as from there ,nieces and nephews with their kids whom i haven’t seen in years. and as far as being retired at times i miss it. aawww, herdy..then I’ll just have to wait when I am there for a visit before I could watch one of your plays…that is pag nataon..wish ko lang, mataon din..
You have? Please let me have it… So I can delete, haha, joke. No, I want to see it, please. there goes the techie generation in them. i am not one .i do not even have a cell phone.i do not like them.if people want to call me they can reach me on my home phone. i detest them.i cannot stand people talking loudly or laughing or very rude on them and can hear them. in some ways i am a very private person. Your right some do not have a sense of privacy. They do not only compromise their privacy, they intrude on others’ as well. And yes, I detest people mindlessly using their phones and conversing loudly in public spaces, like jeepneys. and on restaurants and driving. my husband have one because of his job..they supplied it for him.he does not like them either but he is the area super for the company so he has to have it. Right he has it by vice, not because of caprice or fad. i just did not want to bother you with my impertinent stuff. i think it is too much of me to be gabbing and boring you.you can just tell me to stop when you have enough . Nope, I am having a blast corresponding with you. No worry. i do too.that is why i get carried away sometimes..
by the way i like what you have done to the” kapre”very good makeup.whoever the makeup artist is ..good job. haha, actually the body paint was muddled. The bida and the kapre had a physical struggle, that’s why. Tita lita, herdy loves to answer all the comments in his blog. That’s what makes it the number 1 blog in the cyberspace. And that’s why I am one of his “suki”. Please continue bothering him..lol. Thanks, suki. I am blessed to have cyberfriends like you. Hope to see you both in the flesh soon. i am really hooked on it now i look forward to my waking up and before going to bed to checking if he answered me or not and then i worry..is he okay? i hope he is not sick..etc…it ‘s the mother instinct in me..i adopted herdy as one of mine many kids..all my son’s friends call us mom and dad.. The only time I don’t respond is when I did not spend the night in our home in Laoag. I also have a unit at MMSU Batac housing, and I don’t have an internet connection there. i might not be able to come home for my mom’s waksi in november but i plan to come home on my dad’s birthday in july of next year. i spent too much going back twice last year ,my mom’s funeral plus i had to pay my sister’s fare coming here and after 2 months we had to go back there.she is the rn who has retired from there and i petitioned her eons ago and came here as an immigrant last september and when my mom passed away in november i had to pay her way back and forth. thank GOD she is working now these unexpected happenings put a big dent on our budget. Tita, all your generosity will be repaid by heaven a thousandfold. Of course, we know that. And blessings will come in forms better than gold and silver. anyway she retired young.she was a company nurse at general milling there and she is our youngest .she is only 58 years old.her 2 kids a boy and a girl they are in their 20’s lives in marikina and unfortunately she is separated from her husband from pinili . so you commute everyday from laoag? do you ride your bike? how long does it take you? you must in great physical shape to do that. I want to ride my bike to and fro Batac, but my laptop’s a bit too heavy, so I do it once in a while. I take the MMSU shuttle bus. meron po ba kayong video nung play?kailangang kailangan ko po kasi..hope meron..tnx po..